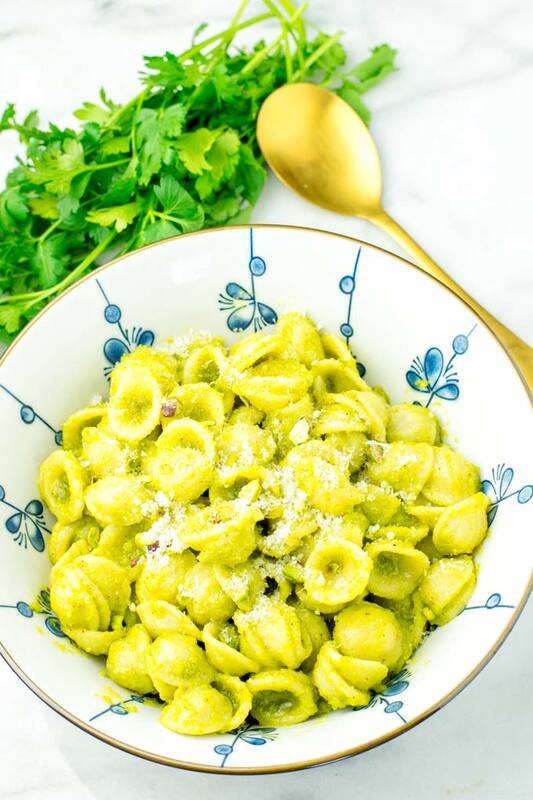 I think seeing this pesto sauce is no surprise when you keep in mind that I have a thing for pasta sauces like this Spicy Tahini Pasta Sauce or my Marsala Sauce. 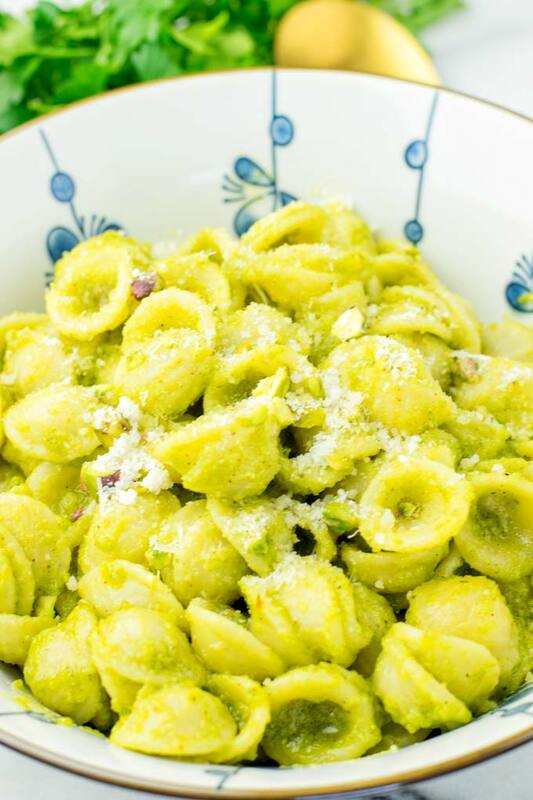 This Pistachio Pesto is no exception. It is a keeper, packed with fantastic flavors, versatile, not only delicious on pasta, also as dipping sauce and much more. It is here to deliver. Once you’ve tried it, you can’t resist. First of all you will need a blender or food processor. This will take around 1 up to 2 minutes depending how strong your food processor is. Alternatively you can use a high speed blender with which will take 1 minute. Note: the times are only broad estimates. Depending on your food processor or blender it can take less or more time. You may have to consider adding a splash of water or a dash more oil for consistency and texture, if the pesto is too thick. Please add more water or oil only at the end of making your basil pesto. Only that way you can be sure the texture is right for you. Give a pulse or short blend at the end. 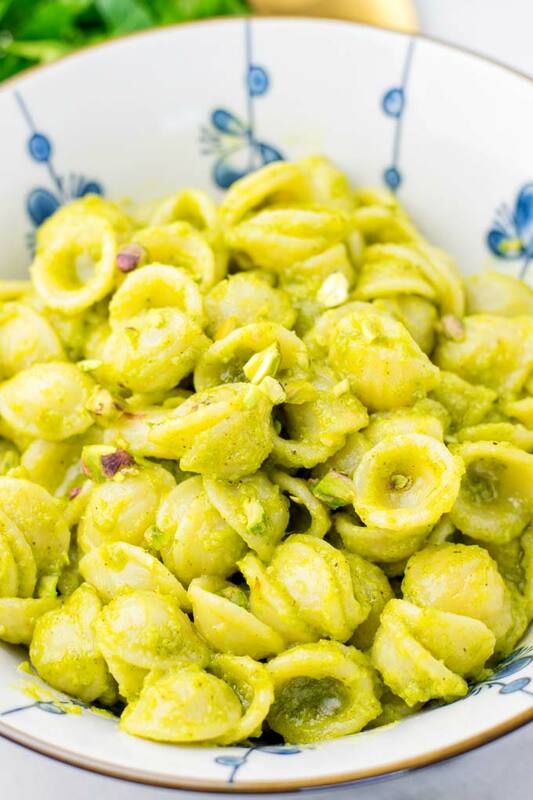 This Pistachio Pesto makes such an amazing meal prep, dinner, lunch and working lunch. I could imagine it is also a keeper for your bento lunch box, kids bento box, and of course date night dinner. 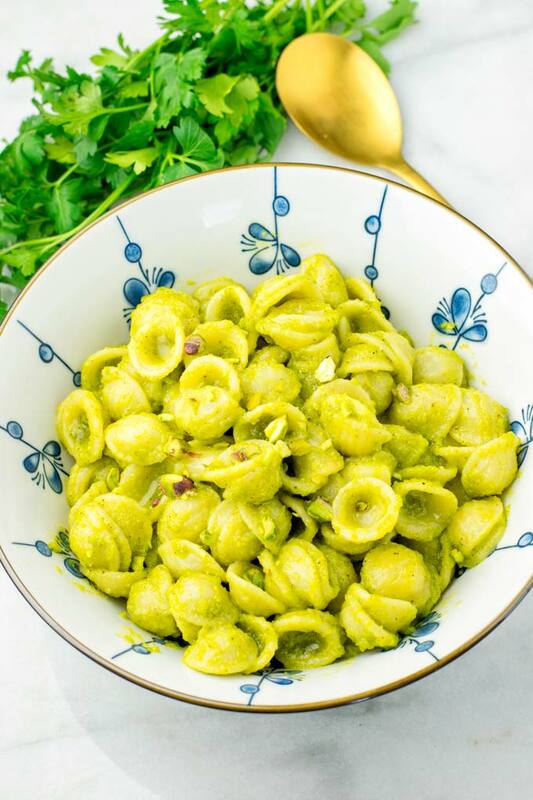 You can be sure everything whatever it is, a dollop of this pistachio pesto makes everything better for real. No basil on hand? How about basil olive oil instead. I haven’t tried that but I would imagine it might work well. 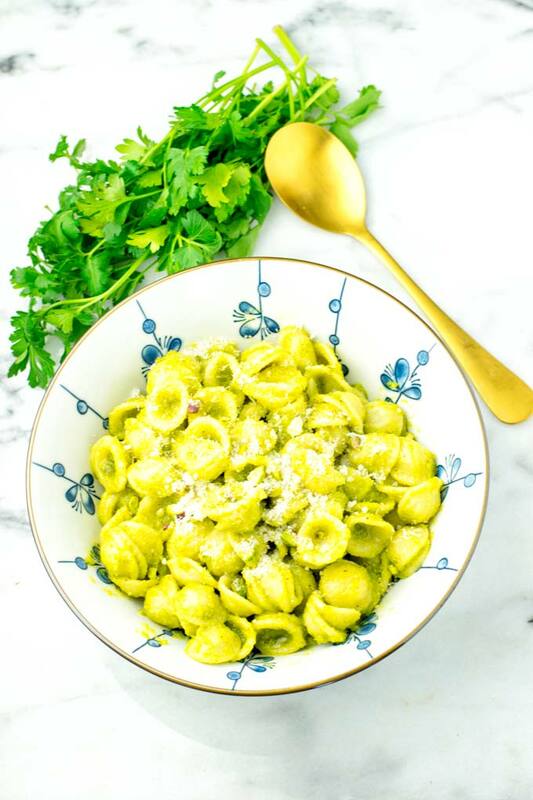 Craving other fresh herbs for this pistachio pesto recipe? Try swapping basil for parsley, cilantro, or even mint. Other nuts for this pesto? No problem just replace pistachios with cashews to make a cashew pesto, or walnuts for a walnut pesto. Nut free pesto: Not fan of nuts? You can use sun dried tomatoes, tofu or just leave the pistachios out. 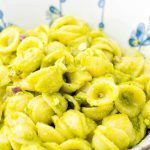 Oil free pesto: you can replace the oil with vegetable broth and you can add 1/2 to 1 avocado, like I did in my Avocado Pesto Pasta Sauce. 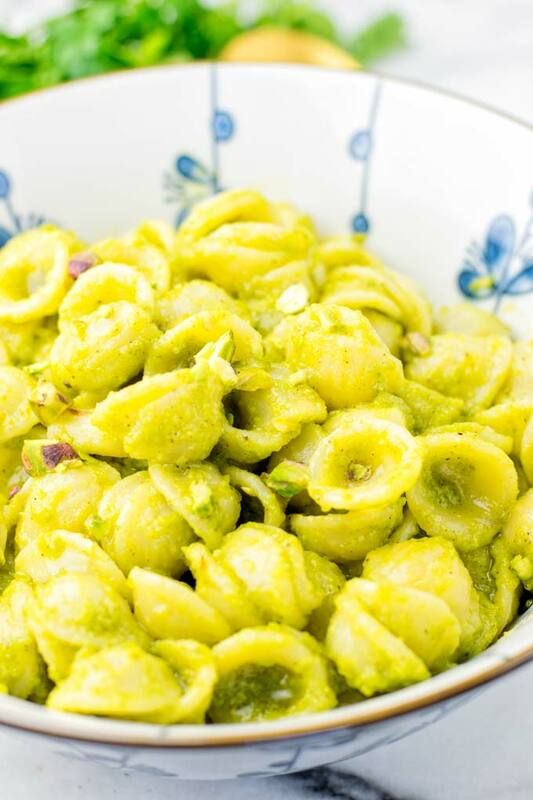 If you try this pistachio pesto, give me a tag on Instagram or Facebook. I can’t wait to see all your remakes and what are up to make with this, guys.